Zoolander is pure, dumb fun, taking its cue from its star, fashion model Derek Zoolander (Ben Stiller). 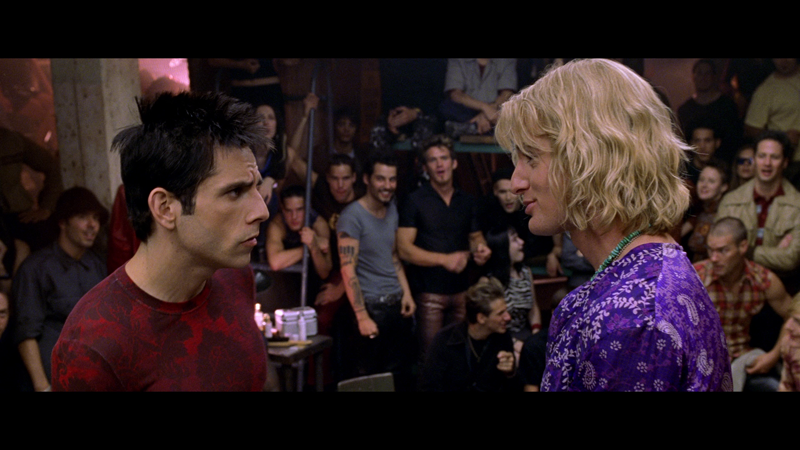 Fresh off the disappointment of being dethroned as the Male Model of the Year by his rival Hansel (Owen Wilson), Zoolander is unwittingly recruited and brainwashed by evil designer Mugatu (Will Ferrell) to assassinate the prime minister of Malaysia, whose efforts to eliminate slave labor in his country threaten to destroy the fashion world's finances. Don't get too focused on that, because that plot is more of an excuse to move Zoolander through a lot of silly scenarios and make jokes at his expense than anything viewers need to focus on. There's plenty of those to enjoy, be it as part of the Zoolander-Hansel dynamic (funny from word one with the idea that Stiller and Wilson are supposed to be two of the best-looking men in the world), Zoolander's relationship with reporter Matilda (Stiller's wife Christine Taylor) or his interactions with the insane Mugatu and his henchmen (including Milla Jovovich and Justin Theroux.) Being an utter dolt makes Zoolander's every action or conversation an opportunity for laughs through either his confusion or lack of understanding, and most land quite successfully, like a trip back home to see his disappointed miner father (Jon Voight) or a meeting with a conspiracy-obsessed former model (David Duchovny). You're never very far from another enjoyable moment in this fast-moving 89-minute film. After directing The Cable Guy and Reality Bite, Stiller calls upon the skills honed on his eponymous sketch TV series in guiding this film, which makes for a movie that can be disjointed, yet cohesive, switching gears often without losing momentum. Working with a hugely funny cast, he was ahead of the game, as his earnestly dumb Zoolander teams well with Wilson's hippie bro, with both on the top of their games in playing what are essentially cartoon characters. That they are likable is a direct result of the actors' skill (and the fact that the movie doesn't overstay its welcome.) Ferrell, playing a straight-up lunatic, is free to do what he does best, while Taylor is the grounding agent necessary to keep the film somewhat connected to reality. But not too connected. It just wouldn't be as fun as it is. The film arrives on one Blu-ray which is in a pun come to packaging life: the Blue Steelbook. The case has new art on the cover, an image of Zoolander on the inside and a quote from him on the back. The steelbook is shrinkwrapped to a cardboard box which has the sales copy and UPC (keeping the steelbook clean), and holds the packed-in item (see the Extras.) Following a reel of footage from the film, the disc has an animated menu (sans the Zoolander guide on the DVD) with options to watch the film, select scenes, adjust the setup and check out the extras. Audio options include English DTS-HD Master Audio 5.1, and French, Spanish and Portuguese Dolby Digital 5.1, while subtitles are available in English, English SDH, French, Spanish and Portuguese. The 1080p, AVC-encoded 2.35:1 image looks great, though nothing indicates that this is a new transfer. The presentation features bright, vivid color (as you'd want from Zoolander's world), deep black levels and a high level of fine detail that makes for an attractive look. A consistent, filmic grain is evident, while there are no issues with compression artifacts, nor is any of the dirt or damage seen on the DVD found here. The audio is presented via a DTS-HD Master Audio 5.1 track, which is full-bodied and engaging, thanks largely to the film's energetic soundtrack. There are some notable sound effects, and the low-end is active, while the surrounds effectively move the audio around with dynamic mixing and placement. Dialogue is clear and distortion-free throughout, making for a solid listen. The key extra is carried over from the previous DVD, and that's the commentary with Stiller and writers Drake Sather and John Hamburg. It's a low-key affair, focusing on the inspirations for any number of elements in the film, production details, changes that were made from initial scripts and how decisions were made in the crafting of the film (not to mention who came up with what ideas, since Stiller and Sather wrote the script, and Hamburg came in for a later re-write.) It's a somewhat bittersweet listen, since Sather, a very funny comedian, committed suicide just a few years after the recording. There are three new extras are available on this Blu-ray, starting with "A Really, Really, Really Cool Teaser for Zoolander 2" (:58). Not a trailer, it's instead a montage of on-set footage, and it would be lying to say it doesn't make one want to watch the film. Also new here is "Breakdance Fight Rehearsal" (4:29), which combines clips from the film with split-screen rehearsal footage with Wilson, Theroux and some stuntmen, as they work through the fight choreography of the scene. It's pretty good behind-the-scenes material. The new stuff concludes with "Alternate Brainwashing Sequence Storyboards" (4:35), which animates illustrations with audio from the film to show how the trippy scene could have been very different, reducing the randomness that makes the bit so much fun and turning it into more of a dream sequence/theme-park ride. Hearing some background would have been appreciated, but you should get the point. Back to the material from the DVD, we get five deleted scenes (7:46), available to play as a group or individually, with optional commentary from Stiller. Some additional celeb cameos are included, along with more Wilson, Duchovny and mine jokes, as well as a lengthy VIP gag that was smartly cut. Stiller offers some production details on the scenes, including why they were removed from the final cut. Five extended scenes (8:00) are also included (with the same options). There are a longer version of the opening interview, a ridiculous version of the pre-gas fight conversation, a removed sub-plot with Mathilda's research assistant, a variation on the brainwashing scene and an additional walk-off bit. Stiller again explains what was behind the decision making here, including Rob Schrab's involvement (with a mention of Dan Harmon.) Rounding out the unseen footage is a reel of outtakes (6:34) that's loaded with flubs from throughout the cast and well worth a look, while somewhat dominated by Ferrell's over-the-top character. For archival purposes, the two VH1 Fashion Awards sketches from 1996 and 1997 (6:42) that gave birth to Zoolander are presented here in letterboxed full-frame. It's interesting to to see what was taken from these shorts and integrated into the movie, as well as how the character didn't change dramatically from its first appearances to its adaptation to the big screen. For completionists, the Zoolander tie-in music video (2:48) for the song "Start the Commotion" by The Wiseguys (heard early in the movie) is included. The video mixes a large amount of clips with footage of musicians representing several eras "performing" the song. It's an energetic bit of dance music that everyone knows, but the video isn't all that special. Back to Zoolander material not seen in the film, we get six promotional Public Service Announcements (2:01). 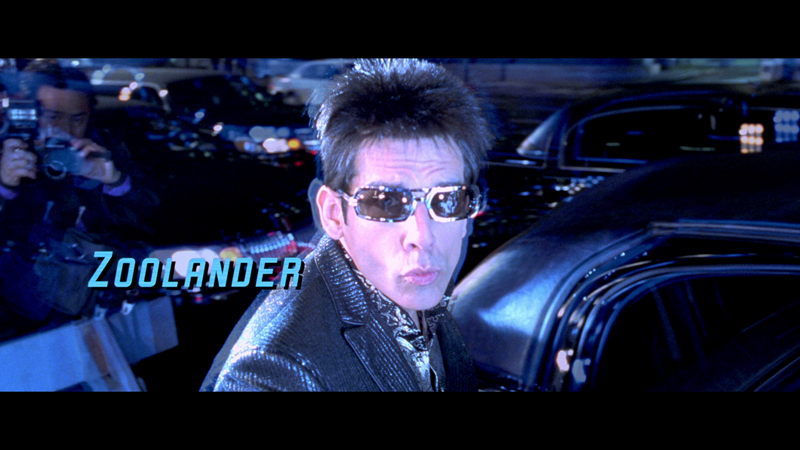 Zoolander offers his brief, shallow thoughts on topics like racism, world hunger and literacy, followed by the same montage of scenes from the film six times. There's not a lot of material, but it doesn't take much time either. The three "MTV Cribs" segments (1:33) are basically the same, offering short (yet funny) glimpses at Zoolander's home, followed by more of the same montages. 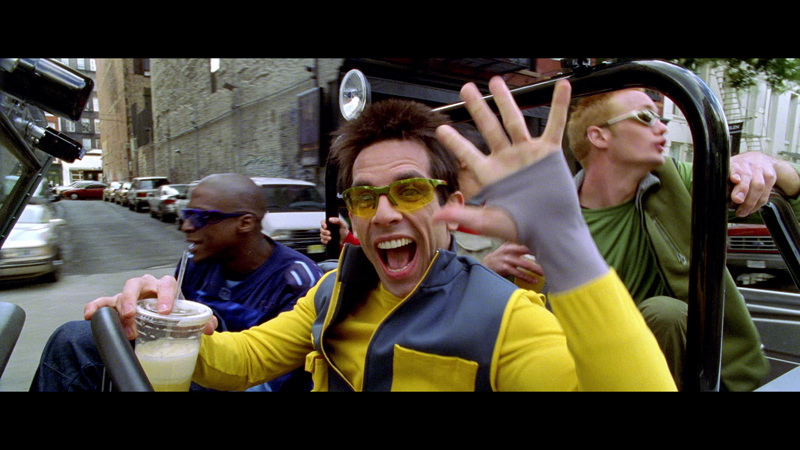 Along the same lines are the six interstitials (2:49), which include three interviews with Stiller alongside Zoolander, and a trio of bits with Matilda, Mugatu and Zoolander directly addressing the camera. Wrapping up the on-disc extras are three manual photo galleries, including 19 images from Zoolander and Hansel's portfolios (images seen in parts in the movie) and 19 production stills, some of which show Stiller as director, and one which lets you really appreciate whatever that face Judah Friedlander is making is. Not carried over the Blu-ray is the alternate end titles sequence, set to the Powerman 5000 version of Frankie Goes to Hollywood's "Relax." Why it was left out is unclear (the song is used on the menus), but some elements were repurposed into the menu animations. Back in the box, you get eight dollars toward seeing Zoolander 2 in theaters when it opens in February (so, congratulations if that actually buys you a ticket anywhere in this country.) 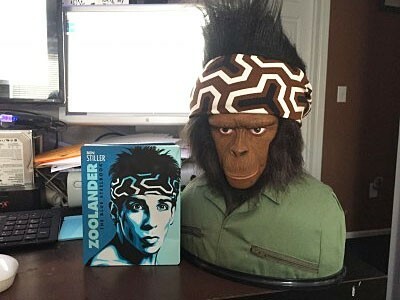 Also in the box is the headband Zoolander wears early in the film, with that trademark Zoolander hair built in (as modeled in the picture by my friend Caesar). It's actually one of the better made promo items of this sort (the headband is actually of quality material), and is fun to put on and make others laugh. Such is the power of Zoolander. 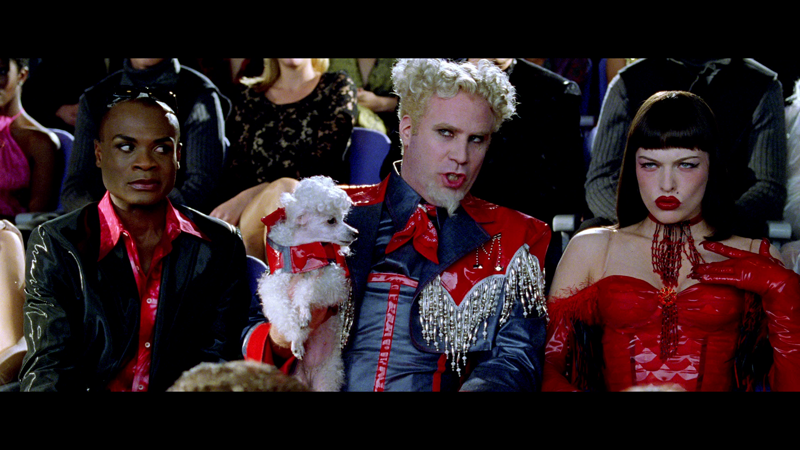 Zoolander is a breezy, fun comedy that effectively creates its world and establishes the rules of that world quickly, resulting in a movie that's compulsively rewatchable, full of memorable moments and enjoyable performances. The presentation here is quite nice, but seemingly no better than the previous version. The real draw for this Walmart exclusive (outside of the brief new extras) is the attractive steelbook and the silly headband. If you don't need these limited items, try holding out until February, when the standard version looks to be released.